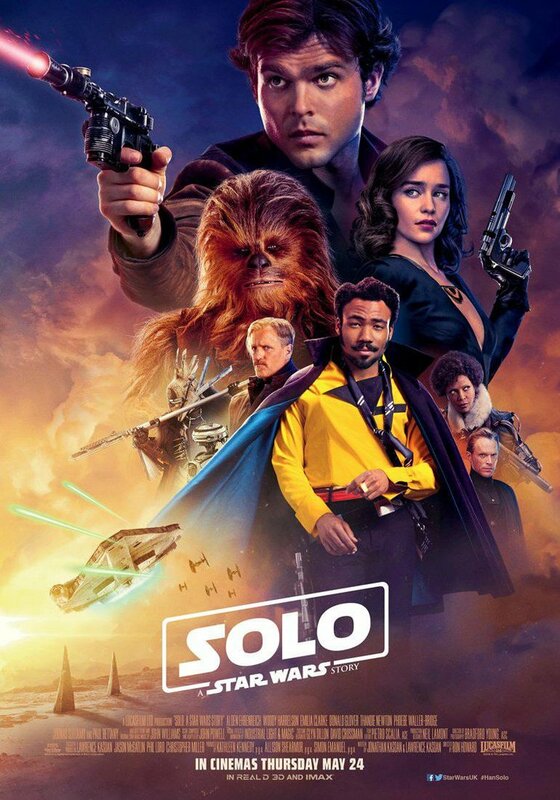 Solo: A Star Wars Story tells the tale of a young Han Solo who finds his footing as a smuggler in the midst of a journey that includes friendship, betrayal, and adventure. Solo is a fun ride that connects outside cannon material (books, animated series, and comics) more than any other Star Wars film to date. Still, despite all the positives, the negatives weigh the movie down past the point of no return. Despite the all of the behind the scenes drama with the film, the biggest question going in was how the movie-going audience would handle a different actor playing the famed smuggler. It took some time to get used to someone other than Harrison Ford playing the titular character. Alden Ehrenreich was more than serviceable in the role and was able to make it his own instead of doing an impersonation. I got used to him as Han Solo a lot faster than I expected. Donald Glover as the smooth-talking Lando Calrissian was a great choice and felt even more natural than Ehrenreich’s Solo. Glover’s performance was excellent and stole every scene he was in. There were some creative choices, however, that muted the character to a degree. Woody Harrelson’s Tobias Beckett oozed the essence of a wise and treacherous mentor that upheld what it means to be a member of Star Wars’ wretched hive of scum and villainy. Emilia Clarke as Solo’s childhood friend Qi’ra was surprisingly well done considering I have not enjoyed Clarke’s work outside of Game of Thrones. We meet two new characters as a part of Beckett’s crew. The four armed alien getaway pilot, Rio and criminal saboteur, Val. They’re killed before we got a chance to know them. It’s a shame because Val appears to have an interesting backstory and Rio seemed like a fun character to see in action. Paul Bettany was miscast crime lord Dryden Vos. There was never anything menacing about him, even when he’s threatening people to do his bidding. Plus, the early revelation that Vos answers to someone even more powerful essentially neutered his character. It would have been interesting to see Michael K. Williams’ interpretation of the role since he was cast for the part until Lucasfilm fired the original directors, Lord and Miller, brought on Ron Howard and reportedly reshot 80% of the film. Williams became unavailable, and Bettany filled in. Droid L3-37 (voiced by Phoebe Waller-Bridge) is without question the worst character Star Wars has ever produced. The equal right’s rhetoric (droid rights) was annoying, out of place and took me out of the film with every syllable that came out of her robotic mouth. Movies are supposed to be an escape, and yet, this character appeared to serve some cooperate agenda as opposed to the narrative. The bulk of Solo takes place ten years before the events of A New Hope. We get many of the legendary moments that encompass the mythology of Han Solo. How Han and Chewie met for the first time was done exceptionally well. Their introduction included an exciting reveal that explains a few things in the previous films that you probably never thought of asking before seeing it here. The legendary Kessel Run represents the entire film as a whole. Full of fast-paced action, light on substance and seemed like window dressing as opposed to being anything meaningful. The actual Kessel Run was more of an escape. It was visually impressive; however, when it was over, the run didn’t come across as this momentous, galaxy-wide legend that Rey fancied, almost 50 years later in The Force Awakens. Did you ever wonder how Han Solo got his name….If you see this movie, pretend that the dimwitted orgin for his namesake never happened. It was a bonafide facepalm moment that is devoid of any creativity. In a pivotal moment, Han shoots first. Yes, it was a callback to the controversial confrontation in the Mos Eisley cantina that George Lucas retconned with the release of the special editions. It was a good idea; however, the execution of the moment purely came across as a middle finger to Lucas instead something with narrative stakes. Solo is a good movie, but it’s not a good Star Wars film. The self-contained plot primarily focusing on one character made a galaxy far, far away feel very small. I’ll still buy it on Blu-ray for the sake of completing my collection. However, despite some fun elements contained in a safe story, Solo never comes close justifying its existence.